Saturday was the eater’s 30th birthday. 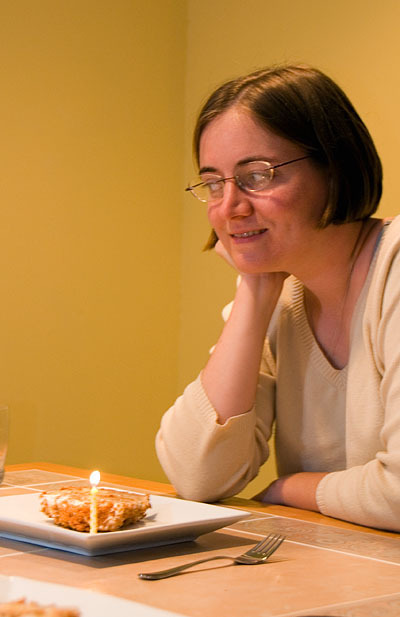 The eater gets to try many of the desserts I make, and from experience, I was pretty sure she didn’t want a cake for her birthday. I tried to think of something interesting to make, but I was just drawing blanks, so I did what any normal guy would do, I asked. She thought long and hard about different things I made and finally mentioned puff pastry; at that moment I instantly knew what to prepare. I decided to make a variation of the classic Napolean or Mille-Feuille that I saw a classmate of mine make back when I was in pastry school; an Apple Puff Pastry Pyramid. This dessert is comprised of three major building blocks: puff pastry, calvados cream, and apple compote. The finished pastry looks rather striking, and, if you can cut it, makes for a wonderful presentation on the plate. 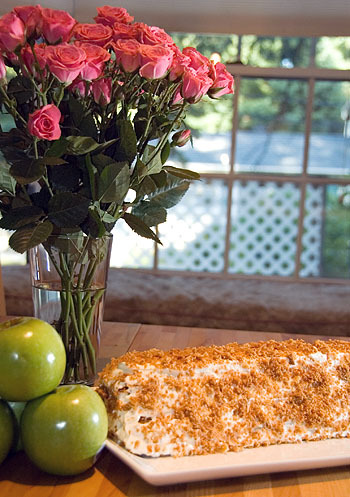 The separate layers of pastry, apples, and cream form layer after layer of visual delight. This pastry is best prepared with a quick puff pastry or, if in a pinch, store bought puff pastry. I tend to like the rich buttery flavors of homemade puff pastry, so that’s what I made here. Since puff pastry seems to be a huge mystery to many, I’ll detail the process I use to make puff pastry. 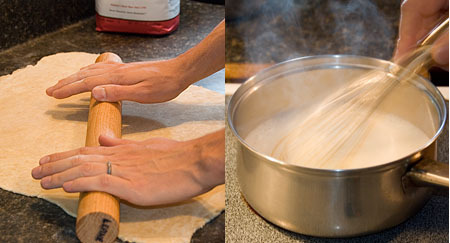 If you can make pie dough and have used a rolling pin before, you can make puff pastry. Just a few ingredients, a mixer (or your hands), and a few minutes of your time and you’ll never go back to the store bought stuff again. Dissolve salt in cold water and reserve. Place flour in the bowl of mixer fixed with bread hook attachment. Chop butter into small cubes and add to the butter. just comes together. When the does is done, it should resemble well-made pie dough. a little bit crumbly at this point but don’t worry, just press it all together. Wrap dough in plastic and refrigerate for 20 minutes. you, fold the dough as you would a business letter: fold down the top third towards you and then fold the bottom third over the top. This is a single turn. You want to perform 5 single turns total. If the dough gets a little too soft or rubbery, return it to the refrigerator for another 20minutes to let it firm up. At this point, you can roll out the dough into any shape you want or store in the freezer for up to a month. In the end, I think the pastry came out pretty good. The recipe is quite clear and, other than assembly, isn’t all that difficult. I neglected to get any good photos of the pastry layers but they did come out as expected. The only change I would have made would have been to serve this with a clear caramel sauce or maybe a cinnamon scented creme anglaise.